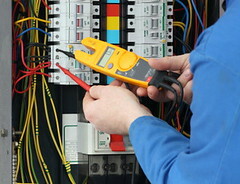 A master electrical contractor is one step above a licensed electrician. After becoming an electrician, one need to spend a certain number of hours (at least 2,000 in most states) working under the direction of a master electrician. After spending the time, one can take a master’s exam and get master electrician’s license which helps them to qualify as an master electrical contractor. Electrical contractors with this level of knowledge not only know how to install the usual electric systems and repair electrical problems but they will also help you to design lighting for a certain type of ambiance and will be able to provide eco-friendly and energy efficient solutions. Along with installing eco-friendly recessed lighting in your library or office, they will also be able to go through your entire home to suggest energy savings and find trouble spots and fix them to make your home safer and energy efficient. If you are going to do some serious remodeling, and that includes extensive lighting, segregating areas, outdoor lighting, pool lighting, or even ripping down walls and ceilings to add or change lighting, you need an experienced electrical contractor. 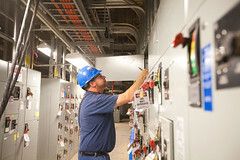 Even electricians can specialize in different areas. Some electrical contractors prefer bigger projects like whole house remodels, while others like simply outdoor projects instead. If their advertisement isn’t specific, ask when you call. One really cool advantage to hiring a real electrical contractor is that they get unbelievable discounts on lighting fixtures. That chandelier you saw for $5,000 can probably be purchased by your contractor for a good 20% less. It’s easy to find such contractors online – even if he lives in the same zip code! There are some quality online job boards, online classified ads placed by people who can do these jobs. Places like Hirecontractor.com have many qualified individuals who’d love to hear from you. Just post your project and you will hear back from several electrical contractors. This website has contractor ratings, past projects, references etc providing you in depth details about a contractor than any other online directory.